This is a picture of my father Pte. John B. Shivas. The approximate date is 1939. 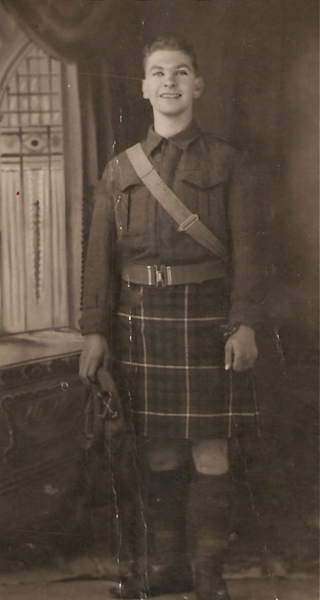 It was taken when he first joined the Seaforth Highlanders 4th Battalion, 51st Division, and before going to war. I would also like to contribute a follow-up of my father's WWII Recollections (see 'Open Document' below). Shortly after my father's WWII recollections was submitted (see picture #1638), I received a report of an interview with my father which had taken place back in 1978 of his WWII experiences. I have compiled this interview in essay format as it had been narrated. The words and terms are written as they were spoken at the time of the interview. As part of this presentation, I have also included both the employment of my father prior to joining the Seaforth Highlanders and going to war and where he was employed after returning home from the war in 1945. Hi Pamela, you might remember us visiting you in Owen Sound around 1979? with your Aunty Aimee and her daughter Aimee who is my Mum. This is a fantastic record and I will show it to Mum (Aimee) when she comes to visit on Sunday.